As Amish widow Emma Yoder contemplates the task ahead, her thoughts center on one: What if she fails? Longing to remove a burden from her family by becoming self-sufficient, Emma has offered to hold quilting classes in her home. But when she sees the patchwork of faces assembled for the first lesson, her confidence dwindles as doubt takes hold. 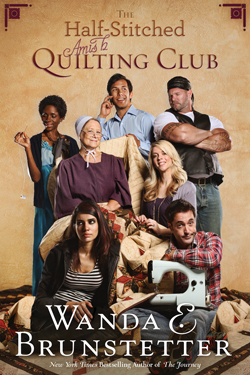 There’s Star Stephens, a young woman yearning for stability; Pam and Stuart Johnston, a struggling couple at odds in their marriage; Paul Ramirez, a widowed father hoping to find solace in finishing a quilt; Jan Sweet, a rough and tough biker looking for something creative to do; and Ruby Lee Williams, a preacher’s wife seeking relaxation amid mounting parish problems. While Emma grows to realize her ability to share her passion for quilting and her faith, the beginning quilters learn to transform scraps of fabric into beauty. And slowly, their fragmented lives begin to take new shape—some in unexpected ways—with the helping hands of each other and the healing hand of God.